In what initially sounds like an episode of American Horror Story: Apocalypse, Satan’s people are coming for your favourite witch. 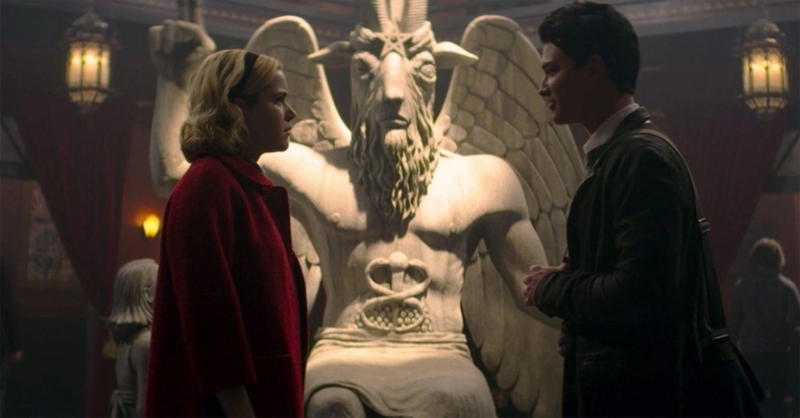 The story is, according to the New York Times, that a Satanic Temple in Salem is suing Netflix for $50 million for copyright infringement and misrepresenting their ideology — after their show, Chilling Adventures of Sabrina, used a replica statue of their deity Baphomet on set. Lucien Greaves, fantastic name for someone who is the co-founder and spokesperson of the Satanic Temple, tweeted some comparison photos and called the reboot “asinine Satanic Panic fiction”. Since, the Temple of Satan file a lawsuit claiming that Netflix violated intellectual property laws — not claiming ownership over Baphomet but of their interpretation of it, which is pretty different to the more common renditions, enough for them to have copyrighted their version. There’s a bit more to it all than just copying a statue, too. The show uses Baphomet as a dark symbol, giving him a bad name. According to the lawsuit, Baphomet is actually a symbol of the Temple’s mission to “encourage benevolence and empathy among people rejecting tyrannical authority, advocating practical and common-sense justice, and undertaking noble pursuits guided by individual will.” Meaning Bapho is a good dude!